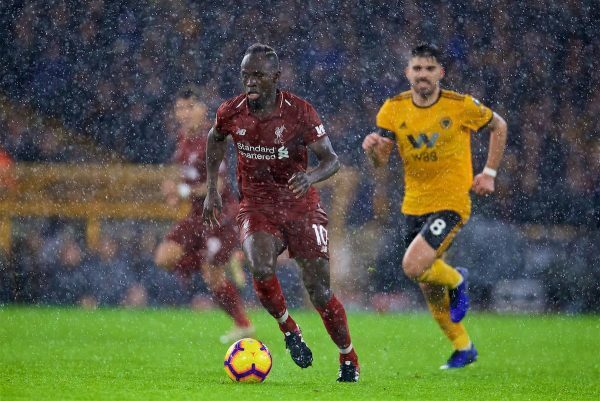 Liverpool extended their lead at the top of the Premier League to four points, impressively dispatching a strong Wolves side to win 2-0 at Molineux. 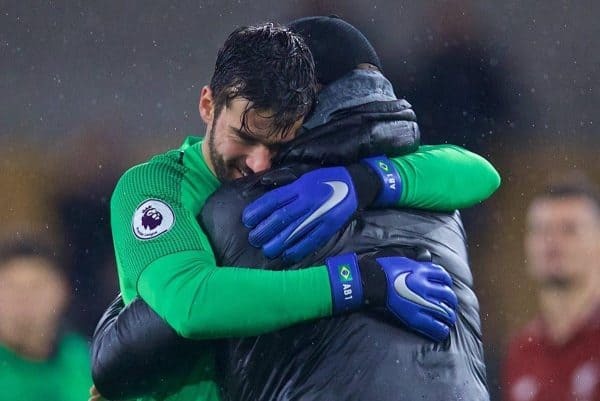 After a rare error in last weekend’s victory over Man United, Alisson showed no signs of any knock to his confidence, picking up yet another clean sheet. The Brazilian wasn’t overly troubled, but was alert to stop a number of Wolves efforts on goal after Liverpool surrendered possession in dangerous areas. Did especially well to hold on to the ball in extremely wet, slippery conditions. Stepping in at right-back after a minor injury concern, Milner largely coped well in a relatively unfamiliar position, providing a steady presence defensively and using the ball intelligently as ever. Wolves regularly hit long diagonals to Milner’s flank in the first half, and he took a little while to get fully up to speed, but grew into the game well thereafter. A couple of dodgy moments in the first half saw Lovren fortunate that Wolves were not more ruthless in punishing his lapses in concentration. On one occasion in the first half, Lovren sloppily allowed the ball to squirm through his legs in the box, after which Alisson bailed him out with a smart save. Calmed down as the game went on and played his part in preserving Liverpool’s 11th league clean sheet of the season. Perhaps a little too relaxed at points in the first half when Liverpool weren’t quite fully switched on as a team, but as per usual Van Dijk was a cut above the rest, dominating his battles and marshalling the back line with authority. Demonstrated his surprising burst of pace to keep up with the blistering Adama Traore in a one-on-one contest, and positioned himself superbly to cut out several dangerous balls into the box. A lovely, volleyed finish to effectively put the game to bed—the Dutchman’s first league goal for the club. Uncharacteristically off the pace for periods in the first half and took some time to get to grips with the adverse weather conditions, misplacing a few too many simply passes. Much improved after the break, making several important defensive contributions and galloping up the wing to link up with the attack. After his outstanding display against United, Fabinho didn’t quite catch the eye in the same manner at Molineux, but was nonetheless quietly effective in the middle of the park alongside Jordan Henderson. Got away with a badly under-hit pass in his own final third early on, which Wolves failed to capitalise on. 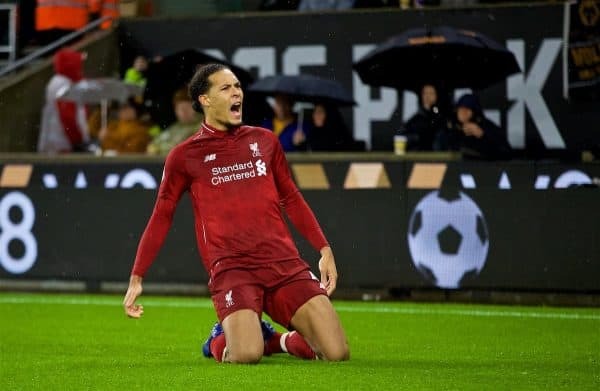 That moment aside, the Brazilian was in the right place to break up attacks and get Liverpool moving forward with his smart use of the ball and ability to play his way out of tight situations. Followed up his superb assist against United with another, cutting the ball back cleverly for Mohamed Salah to slot in the opener. Another steady showing which reflected his growing stature and confidence in this league. After starting on the bench against United, this was one of the captain’s strongest performances of the season thus far. A player who still very much splits opinion, Henderson showcased his best attributes despite the treacherous conditions. Reading the play well to anticipate loose balls and aggressively snap into tackles, Henderson won possession on numerous occasions to put Liverpool on the front foot, playing several incisive forward passes rather than the easy sideways option which he is often accused of. What was a relatively lively opening 20 minutes for Keita turned into a disappointing evening as he became increasingly peripheral and lost possession on a couple of occasions in the first half leading to counter-attacking opportunities for Wolves. His ability is obvious, but he struggled to really exert a sustained influence on the game, drifting around on the periphery in a left-sided role which doesn’t quite look natural. 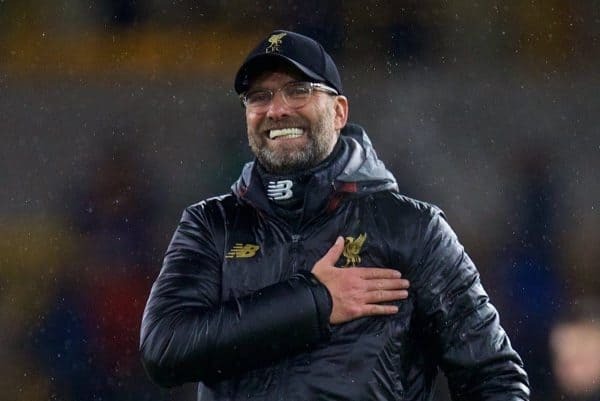 Limped off just before the hour mark with what looked like another muscular injury, but Klopp was hopeful it isn’t major when speaking after the game. Firmino has looked much more like his usual self over the past few games, and was sharp in the opening exchanges for Liverpool as he dropped deep to link play between midfield and the front line. 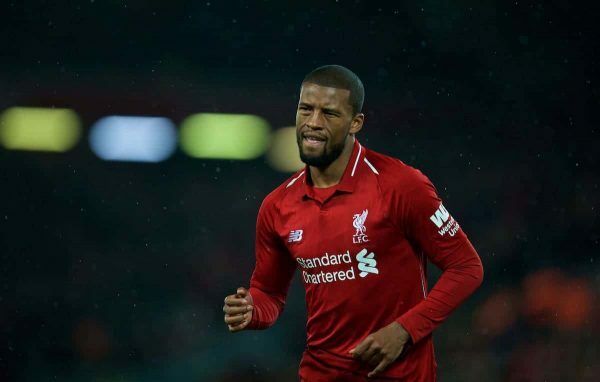 As with several of his team-mates, was guilty of giving up possession a little too easily at times, and his influence faded in the latter stages before being replaced by Gini Wijnaldum for the final 15 minutes. A somewhat frustrating evening for Mane, who regularly picked up excellent positions but was unable to make the most of the promising situations. 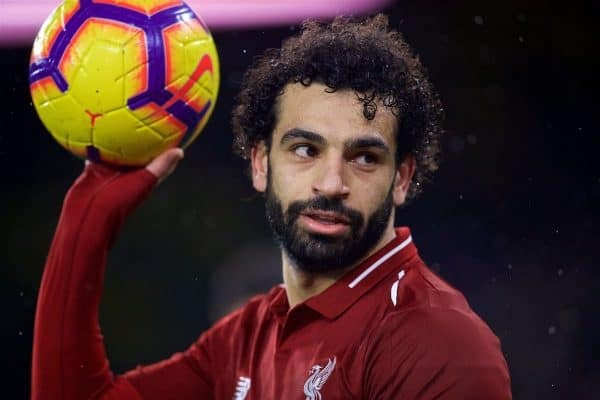 His decision-making was mixed at best, and his final ball mostly lacking, although he did set up Salah with an excellent driving run late in the second half. Even when he’s nowhere near his best level, Mane remains a constant threat—and never stops working back. 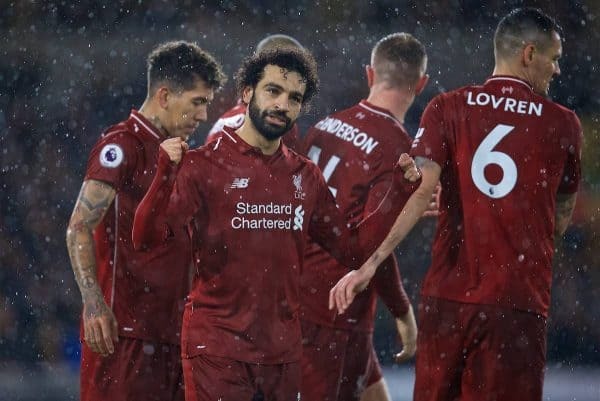 Salah has well and truly hit his stride over the past couple of months following a slow start to the season and delivered another classy performance. His movement to evade his marker inside the box and make a difficult finish look straightforward, nonchalantly flicking in the opener from Fabinho’s cross, showed all the hallmarks of a world-class centre forward. The Egyptian then created Liverpool’s second, floating in an inch-perfect cross for Van Dijk to volley home. Unfortunate not to score more than once—a constant menace to the Wolves backline. 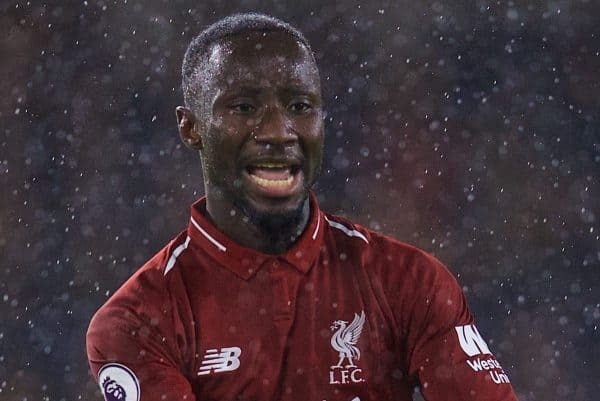 Put in a solid shift, providing his usual graft and energy in the middle of the park to help Liverpool maintain their impetus in the second half. Kept hold of the ball well. Added an extra degree of solidity to help Liverpool see out the final stages. Barely involved in the final few minutes but good to see him back fit and available again after his strong showing against United. Another excellent night for the manager whose side will now sit top of the Premier League at Christmas with a terrific return of 48 points from 18 games, with just seven goals conceded. His decision to go with Fabinho and Henderson in midfield paid dividends, as Liverpool largely controlled the game well, while he was able to afford Wijnaldum most of a night off and keep Xherdan Shaqiri fresh for Newcastle on Boxing Day. His use of Lallana to replace Keita for the final half-hour helped Liverpool maintain their grip on the contest, and he can be delighted with another no-nonsense, professional away performance and clean sheet.